Skipper Krish Sharma’s all-round show helped St Kabir School (SKS) defeat St Xavier’s School, Loyola on the basis of their first innings lead in the under-16 multi-day Dhirubhai Ambani School Tournament at Vivekniketan cricket ground. 60) and Salman Khokhar (92-ball 55) also made important contributions to the total. For Loyola boys, Devdutt Chavda picked four wickets while Shrey Goyal added three more. Krish and Shivam then returned to haunt their rivals with the ball as they picked three wickets each to bowl out Loyola for 129 runs. Yuvraj Billa was the topscorer for St Xavier’s with 131-ball 60. 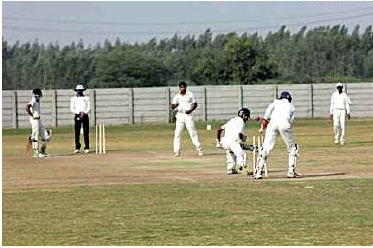 With a cushion of 272-run first innings lead, SKS’ declared their second innings with 65 runs on board for the loss of four wickets. With 338 to win the match and the fate of the match virtually sealed, Loyola batted out the remaining time to post 140 runs for the loss of two wickets. Devdutt (212-ball 51) and Yuvraj Billa (108-ball 50) scored unbeaten half centuries.